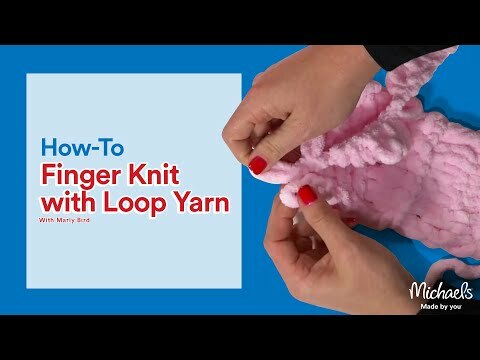 This finger looping yarn is designed for fun, fast hand-knitting projects! No knitting or crocheting is needed. Just use your fingers to pull the loops through one another and watch the fabric appear. Perfect for kids, teens, adults or anyone who has always wanted to knit or crochet, this yarn is a great first step! Red Heart® Loop-It™ Finger Looping Fun™ Yarn is rated 4.5 out of 5 by 118. Rated 5 out of 5 by Denise20 from Never knitted before. Thanks for making knitting fun for me. I made two baby blankets for my first Granddaughter who is arriving in May. Rated 3 out of 5 by michelle83 from Easy to work with & quality consistency problems Yarn is soft and loops are generally easy to work with. The 3.5 oz. size requires several to do a project. Can't find a way to get 7 oz. skeins. Quality is not consistent; some are thick and some are thin. Some rolls have mistakes with sections that have no loops or with lumps of snarled yarn that don't work in well to the project. Rated 4 out of 5 by krachel from Fun, but some issues I had a skein with a lump of string that seemed to have pulled some loops. There were some inconsistencies in the loop sizes and the distance between those loops throughout the skein. I had other ones that did not have this issue though. Rated 4 out of 5 by HeathPops from Love to finger knit! This yarn is great for making baby blankets and other small things. It’s easy to use and makes a nice warm blanket. Problems it has; the yarn is not the same thickness throughout the ball, color not always consistent in balls of solid color. I wish there were more colors to chose from. Rated 5 out of 5 by BethLPN from Beginner This was the perfect yarn for me to learn with. I have purchased 28 skeins so far! Rated 5 out of 5 by Cat granny48 from This brand is the best to work with. It takes more skeins to make a blanket, but the finished product is beautiful and so cozy.